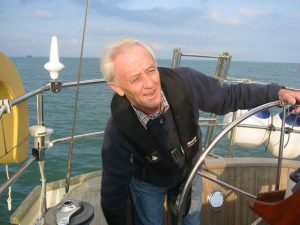 The David Tyson Memorial Fund was established in David’s memory to provide financial support to enable young people to develop their skills and pursue a career within the engineering field. To apply to The David Tyson Memorial Fund please complete an application form here. Please be sure to read the accompanying guidance notes also. You can contact us at any time on 01483 478092 should you need further support. If you would like to contribute to David’s legacy then please see the Fund’s BTMyDonate page. BTMyDonate is a simple and secure online giving platform that allows you to make an immediate online payment. David Tyson (1948 – 2015) was a highly respected permanent way engineer who became an established figurehead and head of discipline for several railway consultants and who successfully established and managed the permanent way departments of a number of companies. With his expansive railway knowledge, intuition and unparalleled flair for track design, he influenced major railway projects and inspired many colleagues both in the UK and overseas. He was also a Fellow of the Permanent Way Institution. David had a natural eye for track layouts and alignments and towards the latter stages of his career was virtually peerless in his ability to see a smooth line and to realise it effortlessly through a nimbly draughted sketch. A sixth sense for how a train rides the track was equally his gift and this culminated in the writing of sophisticated computer programs that not only married the modern world with his understanding of the first principles of track engineering but also belied an acknowledged and envied skill in the ability to develop complex software tools. This was one of his many strong points and often seemingly a passion that ran alongside his continued love for building model railways. Such was his experience and knowledge, to have David involved in a project was considered as having one of the very best in the business and this was reflected in the high regard in which he was very quickly held by those with whom he worked for the first time, including clients. His attention to detail, together with a generous attitude and easy manner, lent themselves to a highly effective application of track engineering know-how to complex and high profile projects. While working on the HS2 project, on which he was the lead track engineer for Parsons Brinckerhoff for over two years, he conceived and wrote an advanced software tool for the in-depth analysis of track geometry. This remains in extensive use today and leads the way in processing substantial volumes of alignment data with unsurpassed efficiency, in-built intelligence and the means for indicating compliance with a variety of standards and recognised good practice. His attributes made him a natural and effective mentor and with his inspiration and caring nature his students and team members gravitated towards him. He was able to assemble and lead teams wherever he worked. Track engineers felt privileged to work for David and his teams were dedicated to him. Outside work, David seemed to have countless varied interests, and an energy and adventurous spirit that put many a younger man to shame. He owned his own yacht on which he lived and worked with his wife, Elif, for several years in Turkey. A keen traveller, he embarked on European road trips in their motor-home. David was also a guitar player and photographer and tried his hand at painting, and of course continued to turn his hand to model railway building. Don’t forget Gift Aid! Using Gift Aid means that for every pound you give, the David Tyson Memorial Fund will receive an extra 25p from HM Revenue & Customs, helping your donation go further.